Steve Haruch. Photo by Lanna Apisukh. 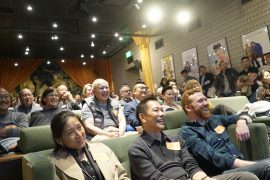 Filmmaker and writer Steve Haruch reflects on attending first convening of Asian Americans makers from the South. Editor’s Note: The Center for Asian American Media (CAAM), along with the Southern Documentary Fund (SDF) and UNC-TV (Public Media North Carolina), hosted “Beyond Borders: Diverse Voices of the American South” with generous support from JustFilms and the Ford Foundation, the John D. and Catherine T. MacArthur Foundation, and the Corporation for Public Broadcasting (CPB) on February 20, 2018. Below, filmmaker and writer Steve Haruch reflects on attending the convening. I am mostly a writer and editor by trade, but I am currently in production for a documentary about the history and influence of college radio. 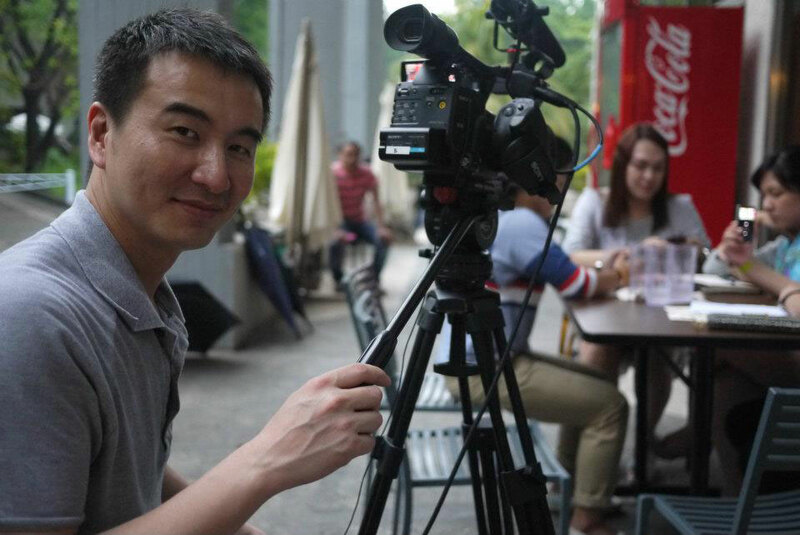 It’s my first film, and we’ve only interviewed two Asian Americans so far, so part of me felt underqualified. Still, I knew I wanted to be there for whatever this would be. I’m very glad I was. 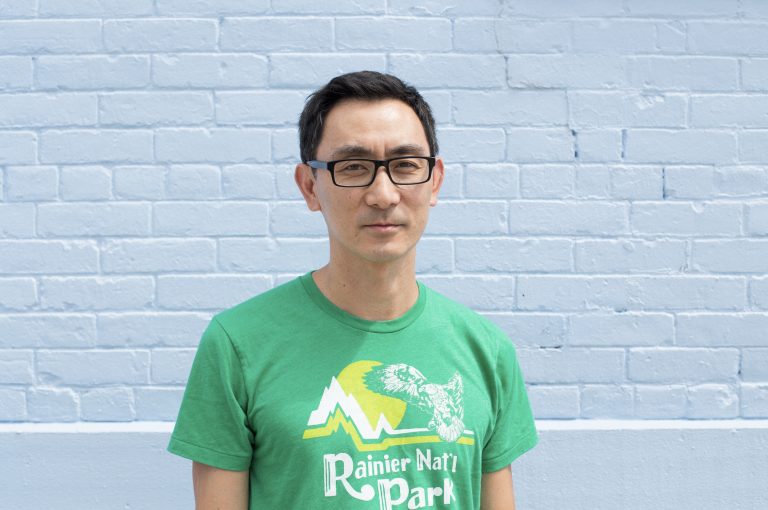 My roommate, Tim Tsai — in addition to being an actual Southern Asian American filmmaker who exists and helps run the Austin Asian American Film Festival — was the first person I met. He introduced me to Yi Chen, who’s at work on a documentary about first-time Chinese American voters. (Two of them absolutely adore the 45th president!) We talked, and they worked on their presentation about A-Doc. And just like that, I had a really good feeling. We ended up going to the same restaurant three times in four hours, but that’s not important. What’s important is that by the next morning, as a whole big group of us piled into a hotel shuttle and headed for UNC-TV’s studios, the event had already exceeded my expectations, at least on one level. I think the group gelled quickly, partly out of what I might call a hunger for affinity. Most of us came to North Carolina — North Cack, if you will — knowing next to nothing about each other, if that. (The director of the aforelinked “North Cack” video, Saleem Reshamwala, was a panelist.) One of the themes that arose was a shared sense of isolation working in the South. I don’t have much to add here except … yes, and a quick tangent. In the late 1990s, I got to be involved with the Chicago Asian American Showcase. Back then, folks would often ask why the organizers were slogging it out in the Midwest, instead of in places with bigger Asian American populations. They always answered by saying they felt they should keep doing the work in Chicago — precisely because there was so little Asian American programming there. So this convening reminded me, in some ways, of that time. Asian Americans are the fastest-growing population in the South, and a bunch of us just spent a whole day in the same room. Good things are, if not inevitable, possible. During our afternoon breakout session, in which we imagined what we’d like things to be in five years, one of the most talked-about items in my group was hoping to be more aware of each other’s work. We also said things like, “What if there was an Asian American Netflix?” I myself may have wondered aloud how we might find and support “the Asian American Ryan Coogler.” To be frank, we put the words “Asian American” in front of a lot of successful things that aren’t. (Hey, if you say it right, “Wakanda” kind of sounds like it could be a Korean verb.) Bottom line being that we need to support each other. Speaking of support, if there are any wealthy Asian Americans reading this who want to give us money — that is, invest in the visibility and vitality of Asian American storytelling — please don’t be shy. Rachel Raney, director of national productions and original content for UNC-TV, mentioned that the South is having a bit of a moment. While that may be true, Southerners know that these moments of outsiders’ interest pass, even if the past of this place never really goes away. (It’s largely a certain version of that past that’s being celebrated lately.) And this “moment” doesn’t seem to include Asian Americans much, does it? 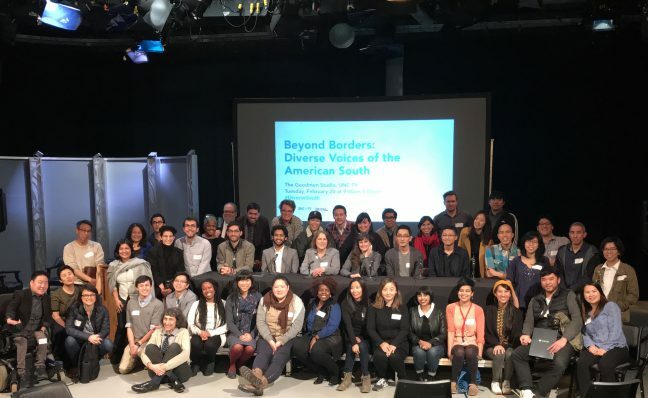 The folks at CAAM have asked me to address the question, which came up several times over the course of the convening, of whether Asian Americans in the South are invisible. I suppose one way to begin is to ask: invisible to whom? The afternoon Media Arts Organization Panel did not include any Asian American panelists, and at the risk of oversimplifying a discussion that included an abundance of nuance, I’ll say that the general impression put forward was that the folks on the dais would love to be engaged more with Asian American filmmakers, but that their Rolodexes, so to speak, did not include many of us. But most of us didn’t know about each other, so there is that to contend with as well. And the question of invisibility is part of a larger question, too, of what real inclusion looks like. 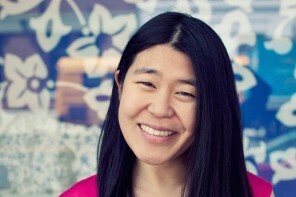 Does “Asian American” include people whose backgrounds lie in Central Asia? Are we representing people with disabilities? Is our work queer- and trans-affirming? Intersectionality came up a lot. On a panel of North Carolina Asian American activists, Manju Rajendram of AORTA spoke of the perpetual foreignness that comes with being an Asian-presenting American. That’s not just the South. (Pyeonchang Olympics, anyone?) Kogonada, the director of Columbus, starring John Cho and Haley Lu Richardson, told me that when he went looking for financing, “time after time, people with money openly said they were not interested in backing a film with an Asian American male lead.” And this is John Cho we’re talking about. Even where we’re not invisible, it seems, we’re often unwanted. So there is work to do. But I think we’re on our way. Steve Haruch is a writer based in Nashville. His work has appeared in The New York Times, The Atlantic, NPR’s Code Switch and other outlets. He is editor of People Only Die of Love in Movies: Film Writing by Jim Ridley, due from Vanderbilt University Press in June. He is currently at work on a documentary about college radio.